Kathy and I helped fund the translation and U.S. distribution of Unbroken Spirit, the incredible true story of Yosef Mendelevich. 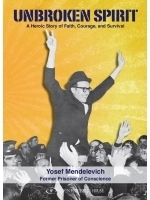 Yosef was one of several Russian Jews who attempted to hijack a plane in 1970 and fly it to the West; they knew they would get caught, but needed to raise awareness of the plight of Soviet Jewry. Josef spent over a decade in the gulag. Unbelieveable story. Newer PostFanTab Acquired By SN!